ROCKPORT — The program is called Cops for Kids with Cancer, and it’s a group that’s now reached out to help a young family in Rockport. 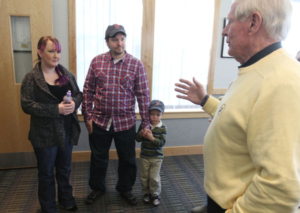 Kyan Meldrum, who will turn 5 in April, accepted a check for $5,000 with his parents Amber Smith and Joshua Meldrum Tuesday at Rockport Police Station. The 4-year-old was diagnosed with acute lymphoblastic leukemia around Thanksgiving 2012, according to his father. 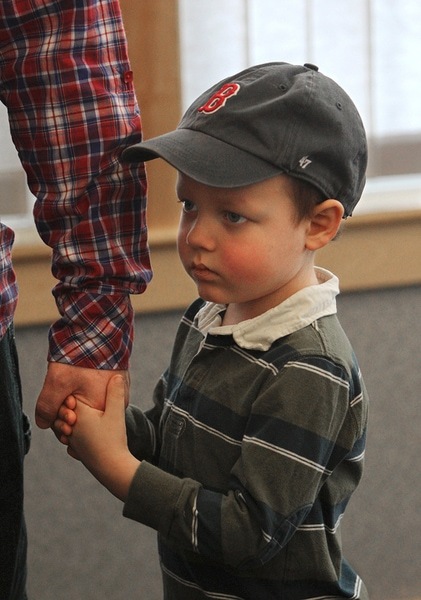 Since then, his parents have been taking him to numerous doctors’ appointments in Boston. But getting there has been a problem. Without a car, the family has been borrowing one to get to Kyan’s appointments. The $5,000 will go a long way toward buying a new vehicle that the family needs, Amber Smith said. Kyan’s treatments will finish in January 2015, according to his father. Robert P. Faherty, chairman of the board for the nonprofit Cops for Kids with Cancer foundation, said that since 2008 when it blazed its path, the organization has raised around $1.4 million and has helped 280 families with $5,000 awards each. The police-based foundation started with helping families just across Massachusetts but has now branched out to other states, as well. Rockport Police Chief Tom McCarthy said that he was contacted by Faherty about the Rockport family. He said that now the department might get involved with the organization and make a donation or work with it. Faherty said that throughout the year, the nonprofit hosts different events to raise funds, including monthly comedy shows or psychic presentations. “The hard part is raising the money,” he said, adding that the foundation doesn’t have a famous spokesperson to help with promotion.